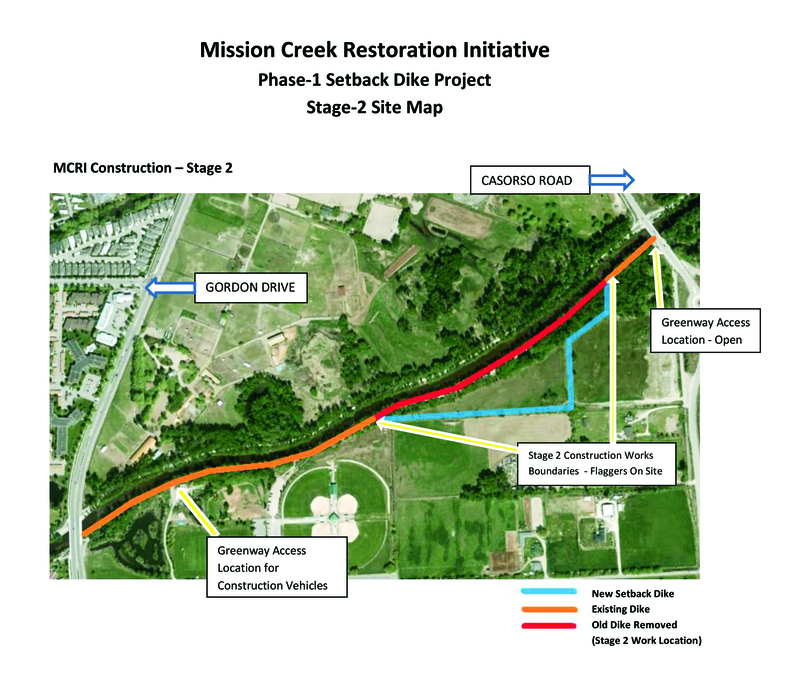 Phase 1 of the Mission Creek Restoration Initiative on the south side of the creek between Casorso Road and Gordon Drive will be completed between August 2nd and 12th, during which the dike will remain open for public use (see project map). Greenway users should avoid the construction area, watch for construction vehicles, and respect construction barriers, signage, and flaggers. provide pools for improved fish habitat. Each bowl-shaped notch will be about 30m long, 6m wide, and 1m deep. Large woody debris, such as stumps and large branches collected during dike realignment, will be positioned within the meanders to help create ideal rearing and resting habitats for kokanee and rainbow trout. In addition, an overflow weir made of large rocks will be located 10m downstream from the east end of the old dike to allow controlled freshet flows into the existing side channel. Rocks will also be positioned in that area to prevent bank erosion. Berms will be constructed along the old dike alignment between the meander notches to limit flows down the former dike path. To further restore natural stream process, a number of inflow/outflow points along the former dike alignment will be created. The project’s Environmental Protection Plan, which was approved by all levels of government, will guide all activities. Environmental and archaeological monitoring will also be conducted during construction.